It is a busy time at CARA. We hope to get back to more regular posting soon. Here are a few asides from recent data, posts, and publications, as well as a note of some awards. Despite “conventional wisdom” or anecdotes one often hears, there continues to be no evidence in survey data of a decline in Catholic Mass attendance nationally. Yet, it isn’t increasing either. 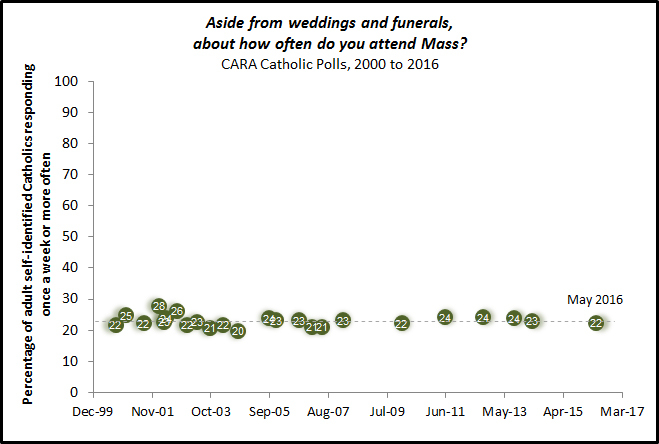 For more than a decade now CARA has tracked Mass attendance in its national polls of self-identified adult Catholics (representative surveys using random selection/probability sampling). The figure below shows the percentage of Catholics attending every week (which is always smaller than the percentage attending in any given week). In the 20 surveys shown here since 2000, there are no differences across time that exceed margin of sampling error. More so the regression trend line is essentially zero (-.0001) meaning absolute stability. In our most recent survey, conducted in May and June 2011, the percentage of Catholics attending every week is estimated at 24%. As we’ve noted elsewhere with growth in the Catholic population over the last decade, even a stable Mass attendance trend line means more Catholics attending in real numbers (i.e. 24% of the adult Catholic population in 2011 is larger than 24% of this population in 2000). Last week in OSV, CARA had a piece on the decline in the number of marriages in the Church. As we note some of this change may be related to an increase in the number of Catholics choosing to marry non-Catholics (and choosing to marry in another house of worship or a secular setting). We do know that the likelihood of a Catholic marrying a non-Catholic in the Church is strongly associated with the larger presence of other Catholics in their diocese. Numbers and proximity matter. But something else is going on as well. Males raised Catholic are slightly more likely than females raised Catholic to leave the faith as adults. The retention rate among male Catholics in the last two General Social Surveys (GSS) is estimated to be 66% (i.e., two-thirds of males raised Catholic self-identify as Catholic as adults). By comparison, the retention rate among Catholic females is 71%. The end result of this is that there are now fewer Catholic men who have never married than Catholic women who have never married. This circumstance was not evident as recently as 1980 when there 4.4 million Catholic never married adult (age 18 or older) men and 4.3 million Catholic never married adult females (extrapolating from survey and Census data). Thus, at that time there was nearly one Catholic never married women for every one Catholic never married man. With the male Catholic retention rate dropping more steeply in recent years than the female Catholic rate, there are currently 7.6 million never married Catholic adult men and 9.1 million never married Catholic adult women. Or in other terms, there are now 1.2 never married Catholic women for every one Catholic never married man. Further evidence for this emerging distribution can simply be seen in the demographics of visitors to Catholic dating sites. For example, on CatholicMatch.com (via Quantcast) visitors are estimated to be 53% female and 47% male or about 1.13 female visits for each male visit. Thus, it appears some of the increase in Catholics choosing to marry non-Catholics is in part a result of Catholic never married women being less likely to meet never married Catholic men (even a bigger issue in dioceses with small Catholic population percentages). The resulting increase in marriages between Catholics and people of other religious identities may in turn be leading to a drop in the total number of marriages in the Church as some choose to marry in other religious settings (or a secular venue). Can Catholics Eat Chicken During Lent? As you type, Google's algorithm predicts and displays search queries based on other users' search activities. … All of the predicted queries that are shown in the drop-down list have been typed previously by Google users. … Predicted queries are algorithmically determined based on a number of purely objective factors (including popularity of search terms) without human intervention. The autocomplete data is updated frequently to offer fresh and rising search queries. So what happens when you start asking a question or making a statement in Google about Catholics, Catholicism, and the Catholic Church? We see Mary appear twice in the top five questions along with the rapture, Lent and evolution. Some also seem to wonder if Catholics are Christians (or pagans). There is a bit there about hypocrites and being wrong as well. Anti-Catholicism is alive on the Internet. When we turn to the institutional Church things get a bit more negative. Some are concerned about the Catholic Church changing the Bible, apologizing for the Inquisition, and about just generally going mad. Chicken is not the only question on the menu. Some also wonder if the Catholic Church is like a thick steak (see G.K. Chesterton), corrupt, or a force for good. I am not sure if I am more distressed by the drop in Catholic searches on Google or by those who are using Google to ask questions about Catholicism tending to have some unusual curiosities. In April we noted that the Census in Ireland will be an important barometer of sorts for Catholicism in Europe. The first report from that Census is out today. It does not include any information on religion. Reports scheduled for release next year will include this information. But the release today does note that Ireland has experienced strong population growth since 2006 : “The total population enumerated on census night 10th April was 4,581,269, an increase of 341,421 on the 2006 census.”A substantial part of this growth was through natural increase (births far outnumbering deaths). This new total means that the Catholic population percentage will need to be at least 80.4% for Ireland to maintain the total number of Catholics counted in the 2006 Census. The Catholic population percentage in 2006 was 86.8%. Some expect this percentage to fall in the 2011 data. I don't think it will fall anywhere near the 80.4% mark. It may even grow given immigration patterns and the economic troubles of the country. But we will have to wait longer to see which is the case. I'd bet on a growing Catholic population in Ireland. If the Catholic population of Ireland did grow at the same rate of the overall population one would expect there to have been nearly 4 million Catholics in Ireland in April 2011 (...here is a March 2012 update on the numbers). Finally, CARA expresses gratitude and thanks to the Catholic Press Association of the United States and Canada for bestowing two awards related to our work. We are honored to have received these awards. Is Interest in Catholicism falling online? I’ve written about research on Catholicism and new media elsewhere. When writing or speaking on the topic I always note that CARA surveys and web traffic research indicate that there is no website that is drawing the attention and visits of a large number of Catholics. Instead, when it comes to faith, Catholics appear to use the Internet in a very utilitarian fashion—either for looking up Mass times or looking for a Catholic charity after a disaster. Catholics are more likely to say they have visited a site for their parish or a Catholic school than any other religious or spiritual site and even then it's only about 5% of all adults for a six month period. Only a few Catholic websites (e.g., websites for the Vatican and the U.S. bishops) typically make it into the top 4,000 most visited in the United States. In this post we reveal some new and perhaps disturbing evidence about the intersection (or lack thereof) of faith and new media. Searchers from the United States for anything with the term “Catholic” in them have dropped significantly in the 2004 to 2011 period (e.g., Catholic school, Catholic Church, Catholic Charities). The graph below shows weekly search volumes in Google (which dominates the search industry). The 1.0 on the vertical axis of the figure below represents the average search volume (Google does not pull the curtain back to let you see real total numbers of searches). 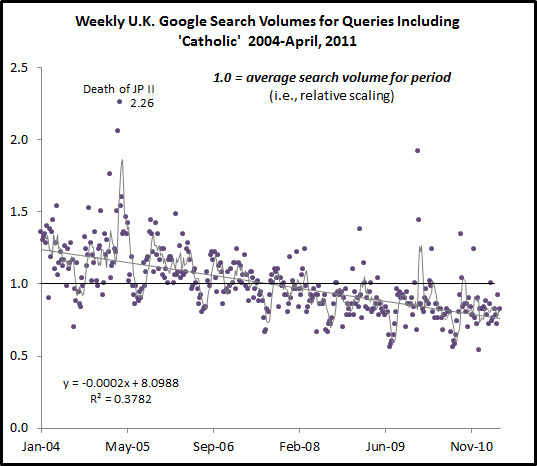 If the trend is at 2.0 on this axis then it means search volumes for queries including the word Catholic are twice as numerous in that week compared to the average for the period measured (2004 to 2011). There is a clear and repetitive pattern in the graph. 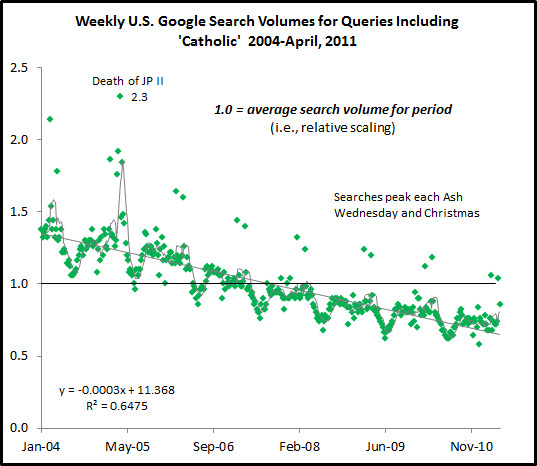 Searches for anything Catholic reach a low point each summer and peak in two weeks each year—weeks for Ash Wednesday and Christmas. 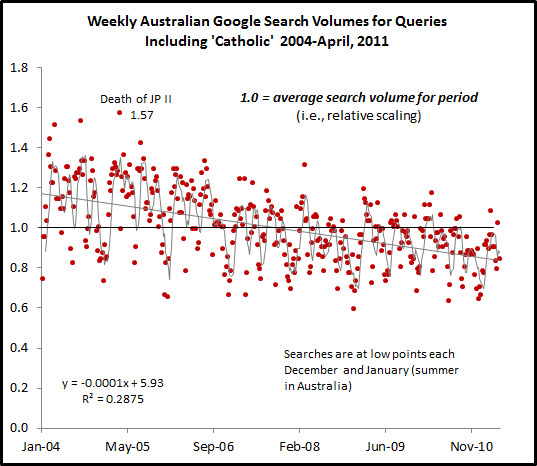 The only outlier here is the significant increase in searches surrounding the death of Pope John Paul II and the conclave that selected Pope Benedict XVI. In 2007, the search volumes dip below average for the period and have continued on a downward pace to date. The decline is linear. Americans are significantly less likely to search for anything Catholic than they were seven years ago. Need some context? The figure below overlays the search pattern for the NFL and American Idol. As one can see there is not some generalized downturn in searches for anything. 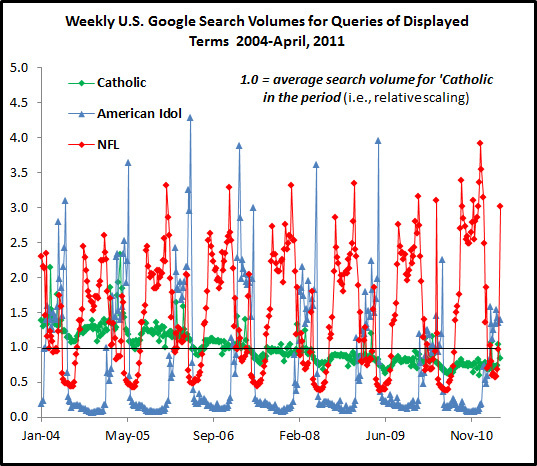 This figure also shows the relative likelihood that someone is searching for something Catholic and searching for two of the juggernauts of American popular culture. Need more context? Here is anything Catholic up against the social network—Facebook. No contest as you might expect (even though one in four Americans is Catholic). The strange thing is that this is phenomenon does not appear to be limited to the United States. The trend for the United Kingdom is shown in the figure below. A similar pattern is evident—although there is more random volatility week to week. Switching to another language and country the figure below shows the trend in Germany. 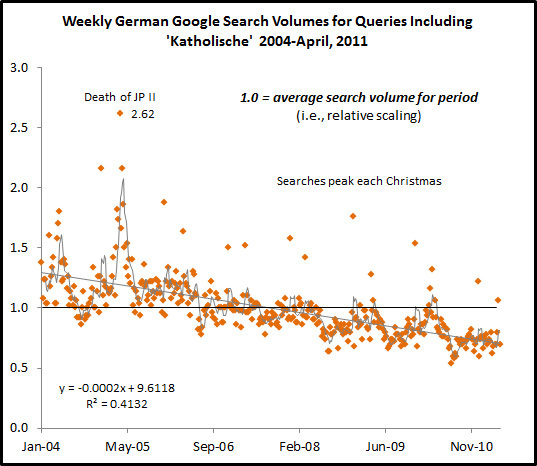 It appears Germans share a propensity to Google things Catholic (or “Katholische”) around Christmas but there is no Ash Wednesday bump as in the United States. 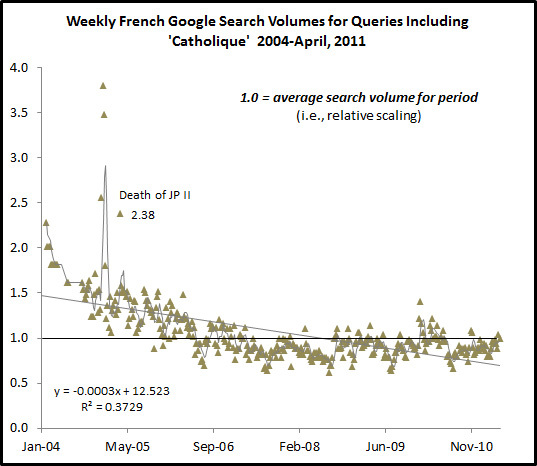 In France we have a decline but perhaps a hint of some renewed search interest in the short-term. Initially, Australia seems to break the pattern until you remember that the summer months here are in December and January. 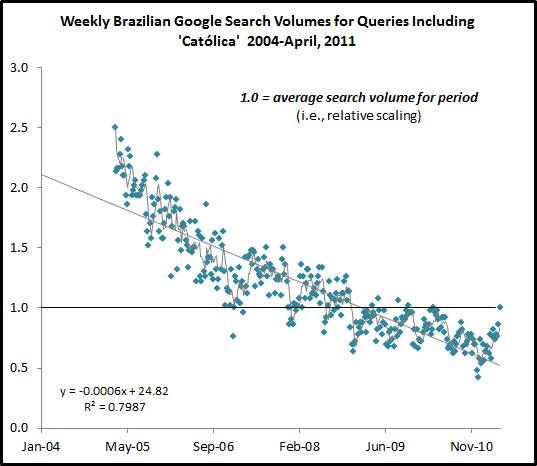 Brazil shows the steepest decline but this is in part due to a lack of search volume record in 2004. 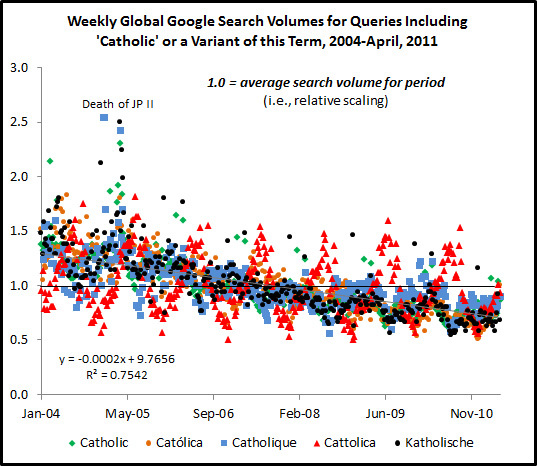 Finally put it all together and here is a look for Google searches for anything Catholic globally in five languages. The red is Italian. Here there is the clearest visual pattern but we cannot learn much from it as the search volume appears to be strongly related to seasonal searches for the Italian resort town of Cattolica. Without a doubt there are many Catholic web sites or blogs where traffic has increased dramatically in recent years (from foreign and/or domestic searches/visits). This is no surprise. 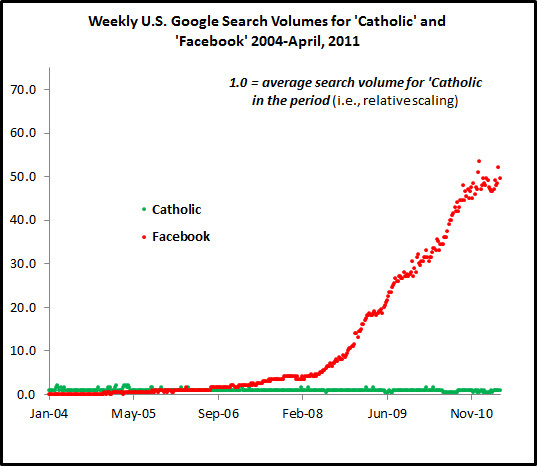 Each Catholic website has but a small share of the overall population looking for things Catholic online. And just as individual stocks can rise even as the overall stock market falls some Catholic websites are doing well (and will continue to do so) despite the apparent fall in general interest in anything Catholic related online. Is this cause to panic? Certainly not. Should we be concerned? Yes. These graphs represent the behavior of millions of people (Catholic and non-Catholic) online. These aren’t responses to polls or attitudes expressed in a focus group. These are real world observations. People are doing less of something and when that thing is “Catholic” online we should wonder what the future is for Catholic new media. With the introduction and adoption of all new technologies everyone races to get a spot in the medium. With the rise of the popular news press people certainly felt the need to create a Catholic presence (where arguably it retains the broadest reach) and this dynamic repeated itself with radio and television. But looking back the Catholic faith survived just fine without establishing a significant home in radio or television (as measured by ratings). The nexus of what it means to be Catholic is still the parish (e.g., the iPhone confession app is designed to be used in the confessional). Do we need a Catholic YouTube? No. Do we need Catholics on YouTube? Yes. However, the data shown above indicates that people may be less likely to be looking for Catholic content now than in the past. Why? That remains a mystery.